This lice prevention set is all you need to keep lice away. 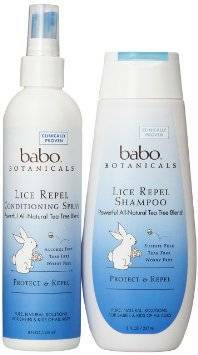 Contains Babo's clinically proven, all natural lice repel shampoo and conditioning spray. Use them daily when a lice outbreak occurs and the smell of tea tree, rosemary, mint and thyme will help repel the lice. The terminator comb which is FDA approved and rated #1 should be used as well a few times a week to ensure 100 percent certainty.